If you have any potted plants, you may already be aware that there are several ways to maximize their environmental quality. If not, take a look at the strategies below to learn more about conserving the most water possible with your potted plant care. 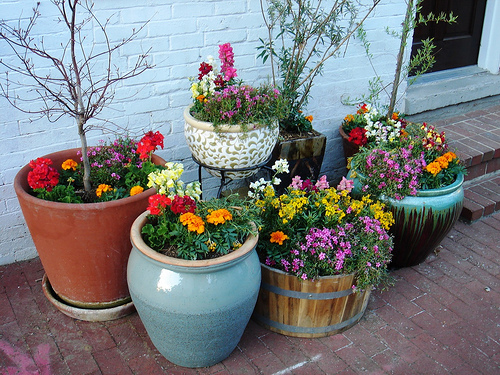 If your pots are made from plastic, ceramic, or glazed terracotta, the evaporation they give off will be minimized and they will hold in more of the water you use. Don’t turn your plants into loners. If you group them up, plants can help keep each other cool through shading, meaning that each of them will need less water. You can stick a smaller pot in a larger one and make it work by putting a layer of sand or gravel between them, helping to cool down the roots. You can set up a drip watering system that will allow you to waste less water while nourishing your plants more efficiently. Do you have any other methods of saving water in your garden?